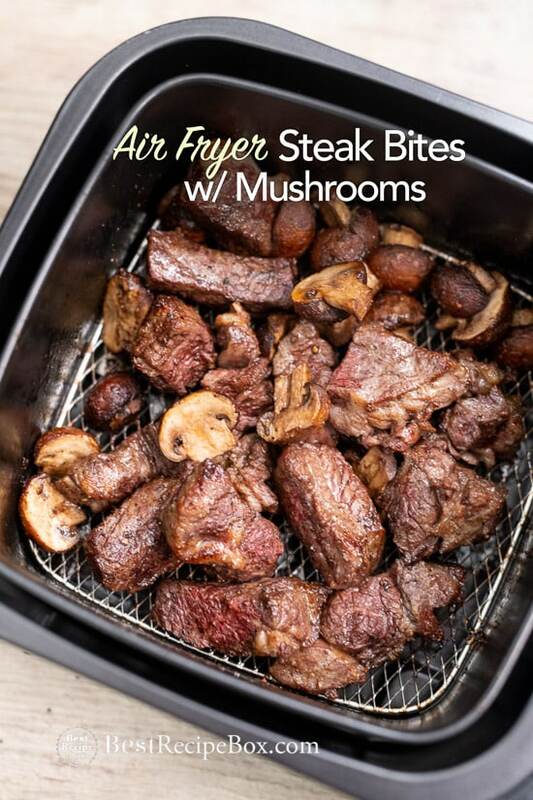 We’re obsessed with steak tips in the air fryer. Air Fried steak bites or steak tips are low carb, keto and paleo friendly. 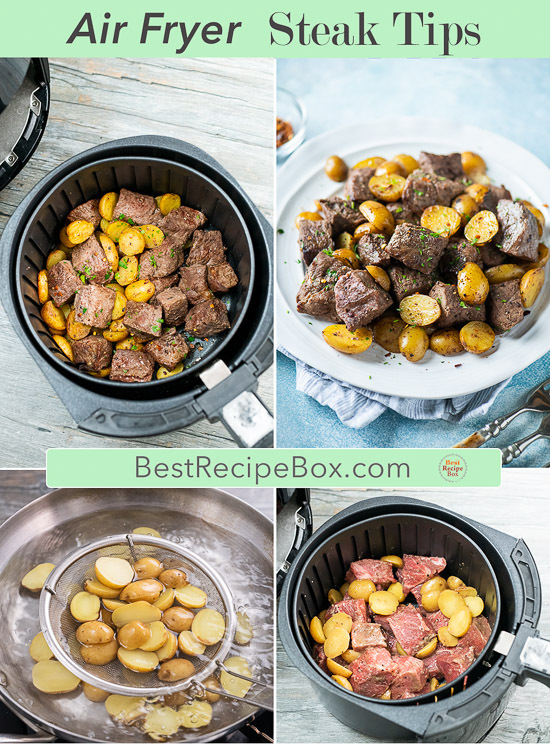 Making these juicy steak tips in the air fryer is a fantastic quick and easy dinner if you add potatoes! 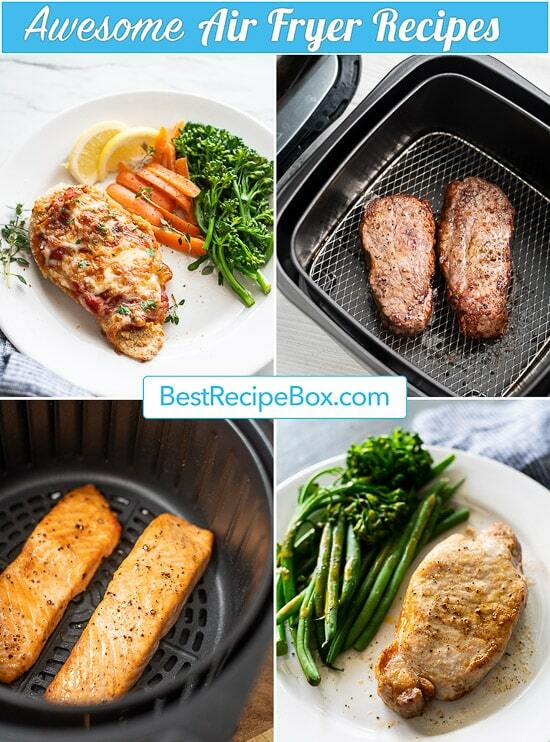 For a low carb Air fryer steak tips version, replace the potatoes with asparagus, green beans, zucchini or mushrooms! 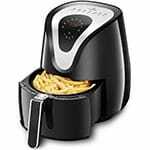 Cooking steak tips in the are fryer is great because you can get a great texture on the outside and inside. Best of all, the clean up is minimal. 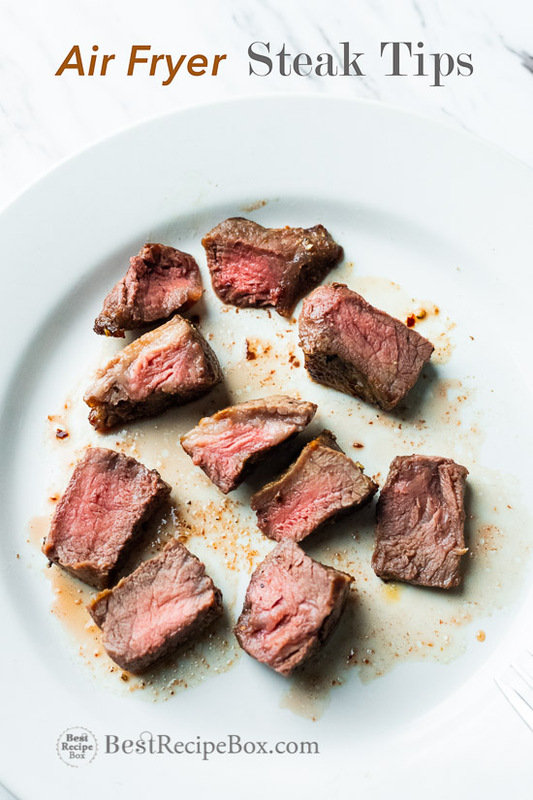 After a few minutes, depending on how well done you like your steak bites, you can dinner on the table. We know you’ll devour these steak tips so quick and you’ll probably make them more often! Remember, you can add mushrooms, asparagus or what ever veggies you like. If it’s potatoes or firmer veggies, make sure to par-boil them a bit first so that the steak bites and veggies cook at the same time. Or you can cook the steak tips first and while they rest, cook the veggies after. 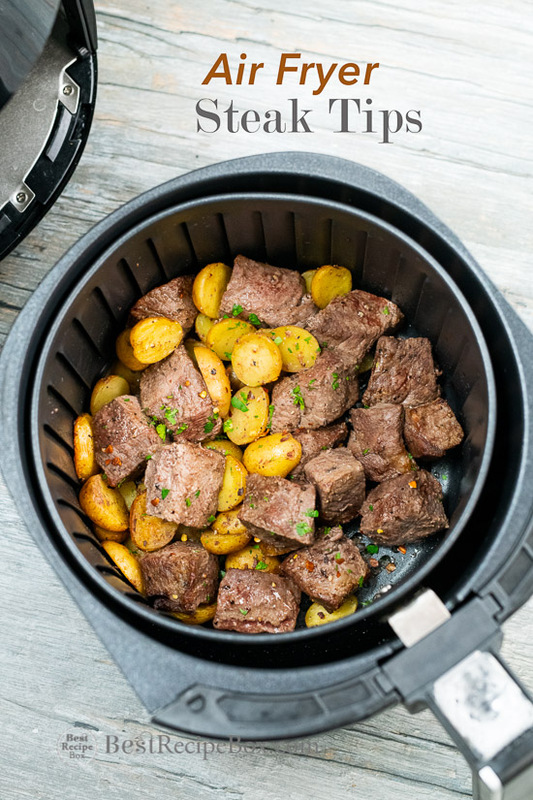 What Temperature to Cook Steak Tips in Air Fryer? Preheat the air fryer first and the hot temperature will give the steaks steak tips a great sear! 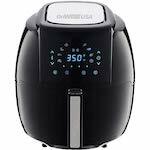 Air Fryer temperatures will vary slightly on each model. But consistency after testing on 6 different air fryers, we like to cook the steaks at 400 F. Like your steak tips medium rare? The hot temperature will give you that perfect outside crust and medium rare center. 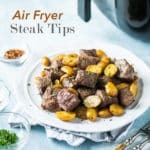 If you like your air fryer steak bites to be medium or more cooked, no problem! Just cook the steak bites for a few more minutes. 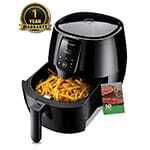 After cooking your first steak bites in the air fryer on your specific air fryer model, you’ll know what exact time is best for you. Love Spicy Cauliflower? This Air Fryer Sriracha Cauliflower is fantastic as well as this Air Fryer Chicken and Broccoli “Stir Fry”. You can cook the steak tips just by themselves, or add mushrooms, asparagus or what ever veggies you like. But if you want to serve with potatoes: cut potatoes into pieces about half the size of the steak bites for them to cook to the best texture. We prefer using pee-wee or baby gold potatoes and then cutting them in half or quarters. For a Keto version, you can cook the steak tips without potatoes or with other keto-friendly veggies. For the types of steak, use your favorite. Depending on the budget, we prefer ribeye, sirloin, tri-tip, and chuck shoulder steaks (aka London Broil steaks). Combine the steak tips and blanched potatoes. Toss together with the melted butter, Worcestershire sauce, garlic powder, salt and pepper. Preheat the Air Fryer at 400°F for 4 minutes. 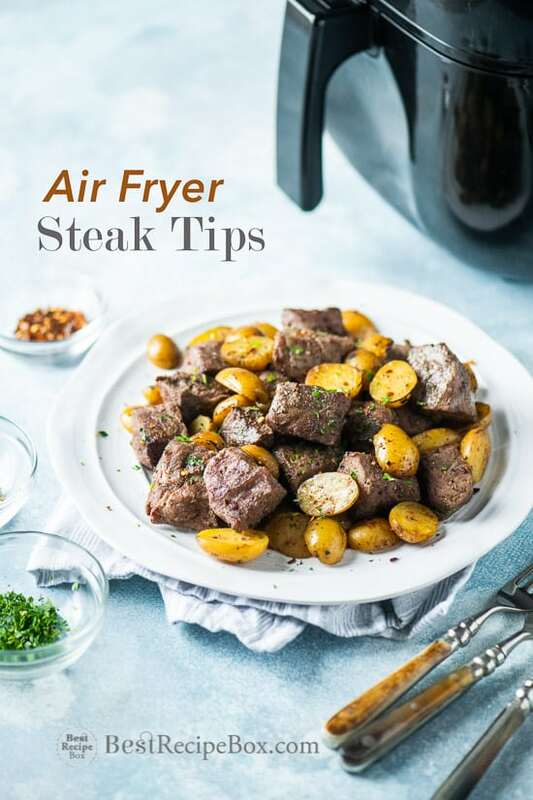 Spread the steak and potatoes in an even layer in the air fryer basket. Air fry at 400°F for 10-18 minutes, shaking and flipping and the steak and potatoes 2 times through cooking process (time depends on your preferred doneness, thickness of the steak, and size of air fryer). Check the steak to see how well done it is cooked. If you want the steak more done, add an extra 2-5 minutes of cooking time. If desired, garnish with parsley, optional melted butter drizzled on, and/or optional chili flakes. Season with additional salt & pepper if desired. Serve warm. 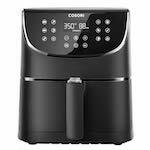 Preheating the Air Fryer is preferable, it creates a better sear on the steak. If you don’t preheat, add more time to the cooking. Remember to set a timer to shake/flip/toss the food as directed in recipe. Followed your instructions word-for -word and my steak tips came out perfect! Thanks for suggesting to cook them in the air fryer. I had no idea it would be this easy. My steak bites came out so yummy! Cooking in the air fryer was a much better idea than on a fry pan.